The 20 Mile March is a concept introduced in the book Built to Last, by Jim Collins. Every New Year millions of people set themselves a New Year resolution. Most of these resolutions revolve around eating better, drinking less, exercising more, losing weight, learning a foreign language, or being more successful. These goals are set with the best of intentions but by February 1st, almost all us have given up on our resolution. We’ve failed. Why is this? Well, for one thing, large-scale change is really hard. Day 1: January 1st. It feels amazing to be on your new diet after the overindulgence of the holidays. The exercise is hard work but you enjoy it. Day 2: The exercise is more difficult than yesterday because your muscles are still sore but you push on through. So overall it’s been a good day. Day 3: Things are getting harder but you make it, just. Your initial enthusiasm is waning. Your body isn’t used to such healthy food and you’re craving some junk food. Also, it was raining today, making it a real battle to get out the door to exercise. Day 6: Today is Friday. You’ve had a tough week at work. You feel you deserve a treat after such a tough week. So today, you don’t exercise and you eat unhealthy food. You promise to do better tomorrow. This pattern of taking days off and trying to make up for it the next day continues for a couple of weeks. After two weeks you’re drained from the emotional battle of trying to stay on track and you give up. A better approach might be to eat a healthy breakfast and lunch every day and walk for 10-minutes every day. No matter what. This might not give you the same instant results as a dramatic fad diet, but it will be something you can stick to and it will yield better long-term results. This second approach is what discipline is all about. Doing something day in and day out over the long term no matter what. The 20 Mile March concept was introduced by Jom Collins in his book, Built to Last. The concept came about from research Collins and his team did into companies that outperformed their industry by at least a factor of ten. These 10x companies didn’t just do well. They thrived. Collins set out to understand why. Why did these companies do so amazingly well when others in the same industry didn’t? In part, the answer to this question has to do with the behavior of the leaders of these companies. 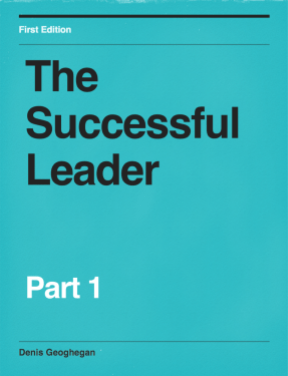 Leaders who incorporated the 20 Mile March structures, goals, and targets into their organization were more successful than those that didn’t. Okay. Great. But what is the 20 Mile March? In a nutshell, it means that you march 20 miles per day. Not one step more and not one step less. Every. Single. Day. No matter what. It means you should have a total laser focus on what you are trying to achieve. There is no chasing after a new interesting opportunities or shiny objects. The truly great leaders and people are consistent and persistent. This is a really difficult thing to do, but then, so is being successful. Imagine you’re standing in San Diego, Calfornia. You want to walk to New York. This is a journey of almost 3,000 miles. You commit to walking 20 miles per day. Every day. No matter what. On day one you walk 20 miles. On day two it’s raining outside and you’re a little tired from day one but you still walk 20 miles. By day seventeen the weather is better and you feel like you could walk all day. You don’t. You discipline yourself to stop after 20 miles. After several months of walking 20 miles a day, 20 miles a day, 20 miles a day, you arrive in New York on schedule and in good health. Contrast this to someone who starts the same journey with a different approach. On day one they feel great and walk 50 miles. On day two its raining so they decide to wait for the weather to clear before continuing. They will make up for this lost time once the nice weather returns. By the time you arrive in New York you’re consistent approach means you arrive weeks ahead of your compatriot. 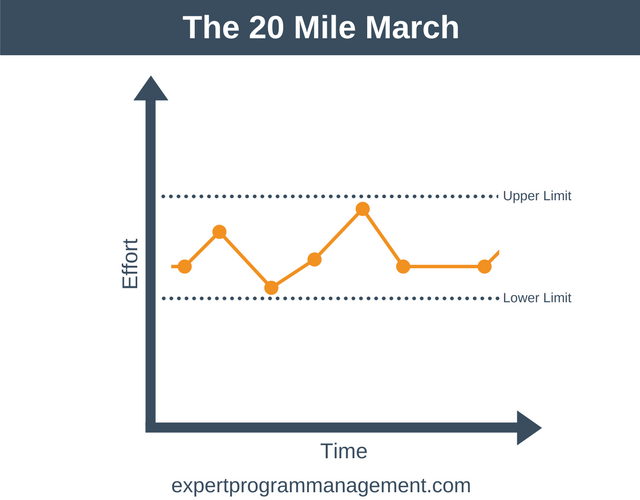 The key to developing your 20 Mile March is to have a lower and upper limit on what you will do. This is shown in the diagram below. For our 20 Mile March to be successful we need to be consistent when times are difficult and challenging. This means achieving or exceeding our lower limit every day. But we also need to hold back from doing too much when times are good and the going is easy. This means having the self-discipline to never go above the upper limit. You need to stay within these limits, day in and day out, over the long-term. Most of us want great things from life. We want to be successful. But the truth is that the majority of people lack the personal discipline, over a long period of time, to get to where they want to be. They haven’t defined and then committed to their 20 Mile March. For our example, we’ll use Southwest Airlines. Southwest demanded a profit from itself every year, even in difficult years. From 1990 to 2003, Southwest made a profit every year, despite the industry as a whole being a profitable one in just 6 of those 14 years. Equally important, Southwest held itself back when the going was good. How? By not expanding operations too quickly. Can you see just how unusual this is? We have an airline profitable every year. Nobody does that in the airline industry! We have a publically traded company prepared to leave money on the table by not expanding too quickly! How many business owners and CEOs would have the discipline to act in the same way? After developing the 20 Mile March concept, Collins came across the story of the race to the South Pole between Robert Falcon Scott and Roald Amundson. Collins was amazed to find how similar the story was to the 20 Mile March. With similar kit and teams, both men set off to reach the South Pole. Amundson aimed to travel between 15 and 25 miles per day, every day. Scott drove his team to near exhaustion on good days and rested up on bad days. The result? Both men reached the South Pole. But Scott had exhausted himself and his team to do so. Scott did not survive the return journey. Amundson’s consistent and methodical plan, with its upper and lower limits, was one of a number of factors which contributed to his success. The beauty of the 20 Mile March model, is its simplicity and the fact it’s applicable to both your professional and personal life. Set your targets around something that is inside your control every day. A minimum of 15% of revenue will be profit. A maximum of 20% of revenue will be profit. I’m going to call a minimum of 5 prospects per day and a maximum of 10. Let’s examine the first example in more detail. By committing to 15% profit it means that we are committed to making 15% profit no matter what happens. Even if the economy is in recession and revenues are way down. We’ll have to cut costs and do whatever it takes. We’re going to find a way no matter what to generate a 15% profit. Likewise, we’ll take no more than 20% of revenue as profit. In a good year, profit may well exceed this number. By setting this upper limit it encourages us to reinvest any excess back into the business in those good years. 1. I’m going to write a minimum of 500 words of my novel every day and a maximum of 1,000. 2. I’m going to spend a minimum of 15 minutes every day learning French, and a maximum of 45 minutes. In life and in business many things are outside of your control. You can’t control your customers. You can’t control the weather. You can’t control the economy. But what you can control is how you behave and what you focus on each day. The 20 Mile March can be used for both personal development and business purposes, and can be summed up as taking a consistent and disciplined approach to achieving any goal. Consistency means that you march every day over the long-term. Discipline means that you walk a minimum of 20 miles every day. No matter what. Even if you don’t feel like it or things aren’t going your way. You walk 20 miles. Discipline also means that you reign yourself in when things are going your way. This will stop you burning out and keep you or your business healthy.